I'm a really big fan of Jeffrey Brown's work, and I was really lucky to meet him at the Top Shelf booth at Wizard World 2006. He was there again in 2007, and I asked if he'd be willing to start out my Batman eating a Burrito sketch book. He looked at me rather quizzatively for second when I asked, and I was worried that he was not into drawing such a silly request. Then he responded "I'm just trying to remember". I thought that was odd...did he forget how to draw a burrito? 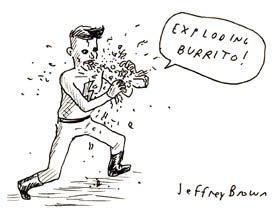 Madman eating a burrito. Apparently he misheard me (I do tend to have an annunciation problem) and drew Madman instead of Batman. However, it was amazingly awesome, and inspired quite a bit of awe from future contributors. My new tradition is to have Jeffrey start off all my sketchbooks (see http://www.sisforstrange.blogspot.com). I'm sure he's thrilled.